Regular visitors to this blog will notice that it has been redesigned. After almost six years, even a blog on Traditionalism and the Traditionalists needs a redesign. Arthur Versluis's recent interview (see below) with the American anarchist Peter Lamborn Wilson, who also writes as Hakim Bey, suggests that Lamborn Wilson’s anarchism is a leftist form of Political “Soft” Traditionalism. 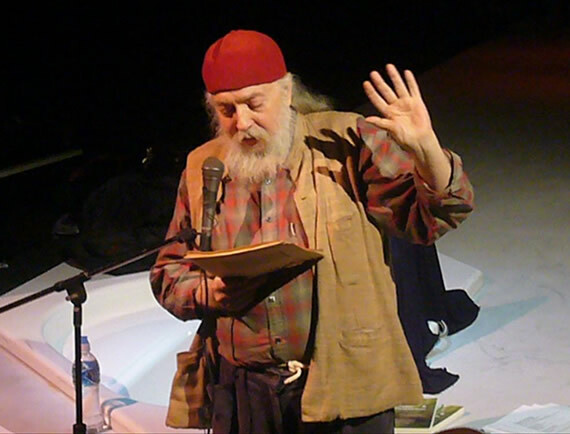 Lamborn Wilson was born in 1945, and after developing an interest in Sufism in New York, dropped out of Columbia University and left the US in 1968. He settled in Tehran in 1970, and stayed there until 1978, editing the journal of Nasr’s Imperial Iranian Academy of Philosophy, Sophia Perennis. It is unlikely that someone in this position would not have been a Maryami, and although Lamborn Wilson has never described himself as a former Maryami, everything about his biography suggests this. Lamborn Wilson certainly became Muslim, and still describes himself as a Shi’i Muslim, if only on the basis that he sees himself as still being everything that he has ever been. It seems, however, that he does not now follow mainstream Muslim practice. Lamborn Wilson left Iran at the revolution, as did Nasr, and over the next seven years moved from the Maryamiyya to anarchism, publishing CHAOS: The Broadsheets of Ontological Anarchism in 1985 under the pseudonym Hakim Bey, which he still uses. Quite what happened between 1978 and 1985 is unclear. Part of the explanation is evidently intellectual, and Lamborn Wilson’s later views on Traditionalism are considered below. Another part of the explanation is evidently personal, as Lamborn Wilson participated in the North American Man-Boy Love Association (NAMBA), and his first use of the pseudonym Hakim (though not yet Hakim Bey) was in 1983, when he published Crowstone: The Chronicles of Qamar, a Sword and Sorcery Boy-love Tale (Amsterdam: Spartacus). Although the Maryamiyya is reported to have tolerated some sexual behavior that mainstream Islam forbids, there are no reports of the Maryamiyya considering “man-boy love” acceptable. Although some critics of Lamborn Wilson dismiss his work as no more than an attempt to justify his own practice of “man-boy love,” in my view that work is too substantial and influential to be so dismissed. In the Versluis interview, Lamborn Wilson makes clear that what he now values in Traditionalism is its critique of modernity, not its “proposal” for responding to modernity. As an anarchist, Lamborn Wilson gives the state–and especially the all-powerful contemporary state–a prime position in his own critique of modernity. His own proposals lead in a number of directions, none of them revolutionary in the normal sense, given his perception that the state always manages to co-opt revolutions. He stresses that his proposals should be taken in a poetic as much as a literal sense. The most famous of them is the Temporary Autonomous Zone (TAZ),“an uprising which does not engage directly with the State, a guerrilla operation which liberates an area (of land, of time, of imagination) and then dissolves itself to re-form elsewhere/elsewhen, before the State can crush it” (TAZ, quoted in Sellars 2011). A less famous proposal, more emphasized in his interview with Versluis, is a form of “even more traditional Traditionalism” reminiscent of that of Khozh-Akhmed Noukhaev: to go back even further into the past, to before the state, to the tribe, and to the form of religiosity associated with it: individual spirituality. The tribe, Lamborn Wilson, admits, is not perfect: “Violence is real, and it will always be real, and disappointment and death are always there.” But at least the tribe is not the state. Lamborn Wilson distinguishes between religion and spirituality, between the organized and the individual. He associates organized religion with the state, as “part of the Babylonian scam.” Individual spirituality, in contrast, is associated with the tribe, and with the ever-present rebellion of the individual against the state, which produces “countertraditions or alternate traditions,” some of them spiritual, often Hermetic. Among these alternate traditions he counts Sufism, which is anarchist in that it understands that “this social world is illusory.” Lamborn Wilson thus prefers Henry Corbin’s vision of “the medieval manyness of Islam” to “the rigid systems of Neotraditionalism that stem from Guénon.” Guénon, then, stands with organized religion, and so does not stand against the state, and thus Lamborn Wilson stands against Guénon and, by extension, the Maryamiyya. Although I have described the more traditional of Lamborn Wilson’s responses as separate from the more famous TAZ, the two can in fact be reconciled: the archetype of his TAZ is the “Republic of Salé,” an autonomous Moroccan city that flourished in the seventeenth century. Salé may be seen as a small-scale human society that resembled the tribe more than the state, and the TAZ may be seen as a transitory tribe. Lamborn Wilson, then, is Traditionalist in his probable Maryami origins, and partly Traditionalist in the terms in which he sees the modern world–including, though this is not much emphasized, a general pessimism about the direction of history, and an apocalyptic vision of a possible future of “centuries of hideous darkness.” Rather as Evola sees the spiritual as the proper root of political action, Lamborn Wilson says that his proposals ultimately have their origin in “mystical inspiration” and “direct experiential perception.” If not the proper root of political action, the spiritual is the accompaniment of anti-state resitance. Lamborn Wilson is furthest from Guénonian Traditionalism in the anarchism in his proposals, which derive also from thinkers in whom the Guénonians have no interest, notably Charles Fourier (1772-1837). He criticizes Guénon’s own proposals to the point of dismissing them. But even so, Lamborn Wilson can probably be seen as a Soft Traditionalist. Leftist Traditionalism is rare, if only because the left generally stresses the practical sovereignty of the whole people, while Traditionalism stresses that the people as a whole are mostly wrong. Though a leftist more than a rightist, Lamborn Wilson does not see the whole people as mostly right, however. Membership of the TAZ is self-selecting, not universal. Lamborn Wilson links up to two further aspects of the phenomena in which this blog is interested. One is the music scene, or rather the rave scene: for some, a rave is a TAZ. Another is contemporary Western Sufism: Lamborn Wilson is enthusiastic about the possibilities of the “Green Hermeticism” project, in which connection he has good relations with Zia Inayat Khan, who helped produce Green Hermeticism: Alchemy and Ecology (Great Barrington, MA: Lindisfarne, 2007, ed. Lamborn Wilson, Christopher Bamford, and Kevin Townley), for which he also wrote the introduction. The main sources for this post are Arthur Versluis, “A Conversation with Peter Lamborn Wilson,” Journal for the Study of Radicalism 4, no. 2 (Fall 2010) pp. 139-165, from which all quotations are taken unless otherwise indicated, and Simon Sellars “Hakim Bey: Repopulating the Temporary Autonomous Zone,” Journal for the Study of Radicalism 4, no. 2 (Fall 2010), pp. 83-108. Most of Lamborn Wilson’s writings are available at http://hermetic.com/bey. My thanks to Jean-François Mayer for bringing the Versluis interview to my attention.